In this article we will discuss one of many strategies to trade using PremiereTrade’s Wizard. For those of you who haven’t met the Wizard; it’s the screen inside your PremiereTrade software that is filled with awesome colors and indicators. You can’t miss it! The Wizard takes technical elements that technical traders have proven over the years to be very effective and displays them, not as multiple graphs that can be confusing, but as a single display that is remarkably easy to understand. -Yellow Caution Zone = Wait for a significant move in either direction. The Yellow Caution Zone also acts as support and resistance. The thickness of the yellow caution zone is determined by the other technical elements. The exact placement of the caution zone and thickness of the zone is calculated by the proprietary algorithm that makes the Wizard unique. The Wizard screen has three other indicators that we will explore further in another article. These indicators display, momentum, buying and selling pressure and volatility. Your personal trading strategy may differ from ours but we like to see 3 full open/close candles into the Green Zone or Red Zone before we enter the position. This is a very basic strategy and is used as an educational tool to help you understand how analyze trades in the Wizard. As you can see in the image below, this strategy has three main things we look for. 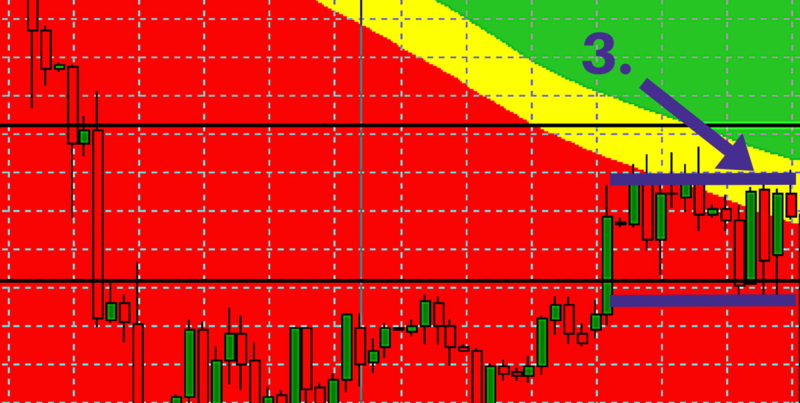 Look for the currency pair to start channelling in and around the Yellow Caution Zone. This can be an indication that a significant move is coming. The image above shows the pair testing the upper line of the Yellow Caution Zone three times then beginning to break to the downside. Look for the currency pair to close three time frames into the Red Zone (in this case). If you see this, enter the trade going in the direction of the move. Practice finding these types of moves and placing your demo trades. As you are practicing this step, do not worry if the trade goes against you. If the trade goes in your favor, and you begin to see the pair approach the Yellow Caution Zone again and it begins to channel, it is time to exit. Especially if you have met your pip goal for the trade. There is, of course, a possibility it could break either way but we have no indication of which direction. Now that you have learned the basics of the “3 Time Frame Strategy”, get out there and PRACTICE PRACTICE PRACTICE!